Camden and the staff are awesome! With all that is offered like the amenities and community involvement, I couldn’t have asked for a better place to live. The amenities are good, and the townhouses are spacious. I feel very safe. However, I wish I wasn’t misinformed about overages before signing. I was told they’re never over 4-5 dollars a resident. However, ours have been about 30 each month, and my neighbors have been about 60 each. Camden is great. I can’t wait to live here again next year. The town style apartments are so nice. They constantly are hosting events and giving away things. They make you feel welcome! I have loved my time at Camden Forest! The staff are (almost) always super friendly and helpful, maintenance is super friendly and timely as well! It is annoying that the gates break down so often and it usually takes a while to get them fixed. Hi Sarah! Thank you so much for your review & feedback! Glad to hear you've enjoyed your time here too! We are hosting a cookout tomorrow afternoon at the pool and hope you can make it. Thanks again! And sorry about the gates. We do our best to get our gate vendor out here each time they get accidentally hit, and apologize that it can take a little longer to fix. Have a great week! Great staff that keeps there residents involved! They are always looking out for their residents and went out of there way to find me a great roommate match while also making sure my dogs are able to stay with me for a good price! Hi Daisy - Thank you so much for this kind review! We hope to see you tomorrow at our poolside cookout for some tasty food, sun & fun! Thanks again for your feedback and have a great week! Hi Paige! Glad to hear you are enjoying the community and amenities! Hope to see you at our cookout tomorrow afternoon! Fingers crossed for weather like today, it was absolutely perfect! Hi Chelsea! Thank you so much! We are so glad to have you back with us and hope you will continue to love your time here at Camden! Love this place, would recommend it to many people. Tad pricey though. But In some ways you do indeed get what you pay for. Great location as well. Hi Tolllie - We appreciate your kind comments and future recommendations, that means so much! Let us know if we can do anything to make the rest of your time here amazing! Living here was honestly the best thing to happen! Everyone is so nice and welcoming and I recommended CF to all my friends for the next school year! Hi Niyat - This is the best thing we've heard all day! We are SO HAPPY you love it here! Please let us know if their is anything we can do to assist you during the rest of your time here. Hi Hannah! Thank you so much for rating us 10/10 (that's even better than the 5 stars!) Hope you are enjoying your spring break and we will have lots of fun events coming up soon! Camden Forest has the best security and they are constantly giving back to the community. They work with you on your rent if you will be late, and the workers in the office are always willing to help. Best apartment complex in Wilmington for sure. Hi Quavon! Thank you for this awesome review, we really appreciate it! Please let us know if we can do anything else to make your time with us great! Enjoy your weekend! I love the size of my apartment !! It is very spacious!! I love the complex! Our pool is the best and I love our gym. Camden Forest is great for student living! Hi Rebecca!! Yay! Glad to hear that! Hope you are ready for some warm weather because we are going to be hosting TONS more events out by the pool. Thanks for sharing your review with us and we hope you have an awesome weekend! My friend convinced me to sign a lease in this complex. After seeing the lay out of her apartment I was hooked. The three levels create space if needed but are easily accessible. The gate provides security which my parents like as well. Hi Quinn - Thank you this feedback! Glad to hear you are enjoying the townhome layout and personal space. Please let us know if you need anything at all. Have a wonderful week! 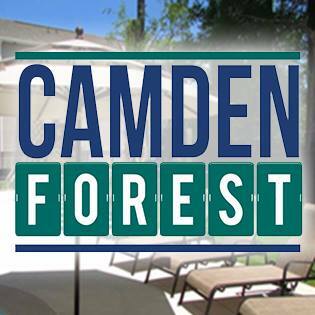 Camden forest is a very pleasant living experience and I enjoy all of their amenities. It is very quiet and a clean community. The rooms are spacious too. Hi Ida! Thank you so much for leaving us a review! We love to hear that you are having a good time here with us. We'll be hosting a pizza party this Thursday afternoon if you are able to make it! Have a great week! Camden Forest is an excellent complex to live in. The people who work in the from office are really nice and help full. Although the equipment in the gym has been out for about two months and they have done nothing about it. Also the maintenance staff is not very friendly and very rude. Hi Kayla - Thank you for bringing all of this to our attention (and thank you for the nice compliment about our office staff). We have had two repair men out to look at the treadmill, who have determined that their is an issue with the motherboard, and a part had to be ordered. We apologize that this piece of equipment has been out of service, but it should be back within a week or two. The other treadmill is working in the meantime! Thanks again and we hope to see you at our pizza party this Thursday! Have a great week! I've lived in Camden since 2017 and I've loved it! Whenever I've had an issue the staff is always super helpful! I love all the resident events Camden has. Giulia - We loved reading this! Thank you! We have been so lucky to have you with us and look forward to the rest of this year and summer! Also, we are hosting a pizza party this Thursday, hope to see you there! Camden has the best staff and always makes sure that you are happy with the place that you're living in. I have referred many people to live in Camden because it is well worth the money. Hi Elizebeth! Wow - thank you so much! We really appreciate this and love that you've even told people about us. That is so awesome! Please let us know if we can do anything to continue to provide a nice community for you or if you have any suggestions to make us better! Have a great week! i love it here. the area is very nice as well as the houses themselves. it’s very nice that each person gets their own level. also with it being gated i feel very safe. Hi Kendal! Thanks so much for your valuable feedback. We love the townhomes too and love that you feel safe in the community. We're having a pizza night in the clubhouse this Thursday, if you want to stop by! 4:30pm! The staff and maintenance workers are very friendly and helpful. The community is always clean, but they don't refill the dog waste bag stations enough. Hi Hannah - Thank you for letting us know your thoughts about the community and our staff. We recently had a maintenance meeting to discuss pet waste, so all stations should be refilled at this point. If you ever notice one out, just give the office a call and we will put in a request. Thanks again for letting us know! I have loved living here and thoroughly enjoy every aspect of it. From the perks of referring others, to the weekly events such as tacos, yoga, and pancakes, Camden is truly a great community to live in! This is awesome! So happy to hear that you've been enjoying our events and living here in general! We're going to have pizza in the clubhouse this Thursday as well as host another pilates event soon! Hope to see you there! Thanks so much Isabella! Love it! So sad I’m graduating but it’s been great. Maintenance is awesome and the fix everything super quick. Do wish the club house has more vegan friendly activities and amenities though! Hi Gabriella - First off, CONGRATS! We are sad you'll be leaving us but know great things are in store for you! Do you have any suggestions for how we can improve our events to better suite a vegan lifestyle? More and more residents are eating healthier and we love it, we just need to catch up with the trends! I will personally look into some options for food events that we could do in the future. Thanks for your feedback and don't hesitate to let us know in the office if you have any ideas! Management was not helpful whatsoever. I emailed her multiple times and she never responded to me. The front desk people constantly gave me incorrect dates for when things were going to come in and have not been accommodating. Hi Mariah - I'm sorry to hear this. Would you like to come to the office to speak in person? Or is there anything I can help resolve now? My email address is anastasia.retson@tpco.com and I am happy to talk with you. Thanks for letting us know and hopefully we can come to a resolution. I have been loving it here so far! I get along perfectly well with my roommates. I’m on the 3rd floor where my room is nice and spacious. Everything is nice and clean and I feel at home. Hi Valerie! So you are loving the 3rd floor? Isn't is great? It's one of our most requested rooms and is so awesome for privacy. Let us know if we can help at all this year and thanks so much for your feedback! So far I really love living at Camden Forest. The community is quiet and clean. One thing that I don't love is that my townhouse sustained damage to the siding and there has been no communication as to when or if that will be repaired any time soon. It's just kind of annoying because we can hear the siding blowing in the wind so we'd like it to be fixed. Other than that I don't have any complaints! Hi Taylor! Thank you for leaving us a review and for bringing up the siding damage. Right now the property manager is still reviewing bids for repair, but once the bid is approved, we will schedule appropriate repairs/maintenance to the vinyl siding. We apologize for the delay, with so much damage in Wilmington, many companies have been booked months out. Thank you so much for bearing with us and being so patient. If you'd like to talk further, just stop by the office. Thanks again Taylor! Camden forest is the best place to live! I love everything about this apartment complex, including the 24hr gym the awesome staff and pool! Everything is awesome!! Yes to this! Thank you SO much Madison! Your feedback really made our day! We are hosting a pancake bar on Friday and hope you can make it. Have a great week!